I love painting with light. Crafting the illumination in my scene by carefully painting my subject with a flashlight is both fun and challenging. One of the biggest problems I run into, however, is not having enough exposure time to paint my entire scene. Shooting under a full moon, working in brightly lit cities or even trying to capture the Milky Way all require shorter exposures that limit the amount of time you can paint with your flashlight. The solution? Paint each part of your scene on a separate exposure and layer them together in Photoshop. 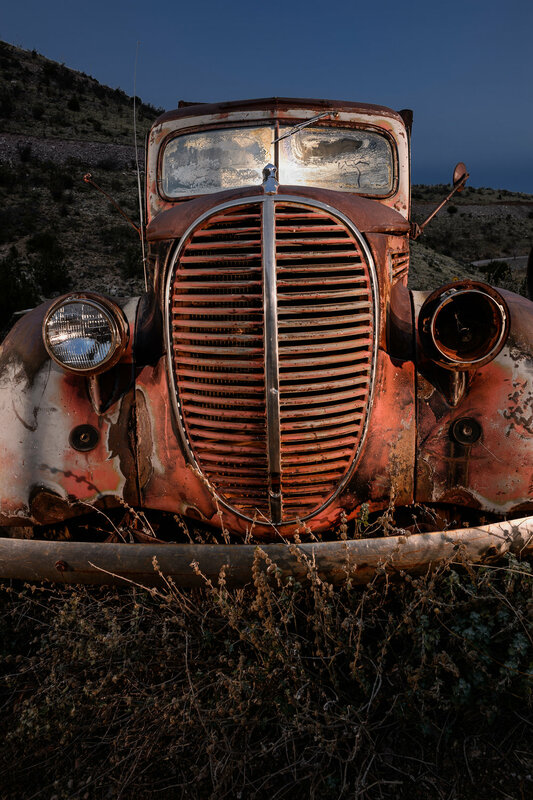 In the following example—shot in Jerome, Arizona—I take this method to the extreme. I made this image at dusk, but I wanted it to look like a night photograph. My base exposure was 1/125, f/11, ISO 100. This very short exposure did not allow me the time to paint with my flashlight like I normally would. So instead I used my speedlight (flash unit) to light different parts of the scene in three separate fast exposures, with the goal of layering them together in post-production. 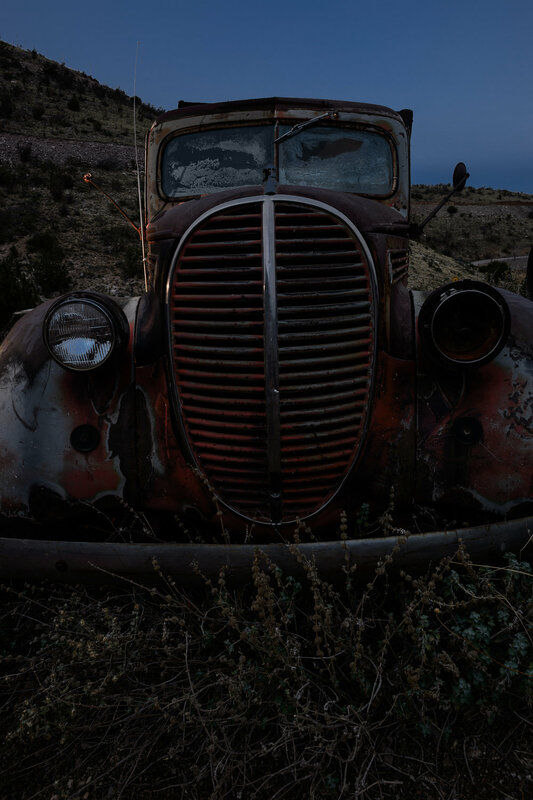 This technique can be used with longer exposures too, and with any light painting tools you like to use. Maybe light pollution or moonlight is limiting your ambient exposure to 30 seconds, and you have 2 minutes of light painting to do. That's another perfect time to layer light painting frames. Shooting to blend later in Photoshop is actually pretty simple. Start by establishing your base exposure. Again, in this example, using a 24mm lens, my base exposure was 1/125, f/11, ISO 100 (Figure 1). Figure 1. Jerome, Arizona. Base exposure of 1/125, f/11, ISO 100. This is the exposure you’ll use for all the subsequent frames. Keeping the exposure constant keeps the background illumination uniform in your final image. With your base exposure established, simply click the shutter and jump into your scene and paint as much as you can. Click the shutter again and paint another area. Continue in this manner until everything you want illuminated has been painted. In this example I shot and light painted three frames, but you could do four, six, ten … whatever it takes the get the lighting right. Figure 2. First exposure painted from the left, second exposure painted from the right, and third exposure painted from behind. Once your images are made, it’s time to blend them. 1. 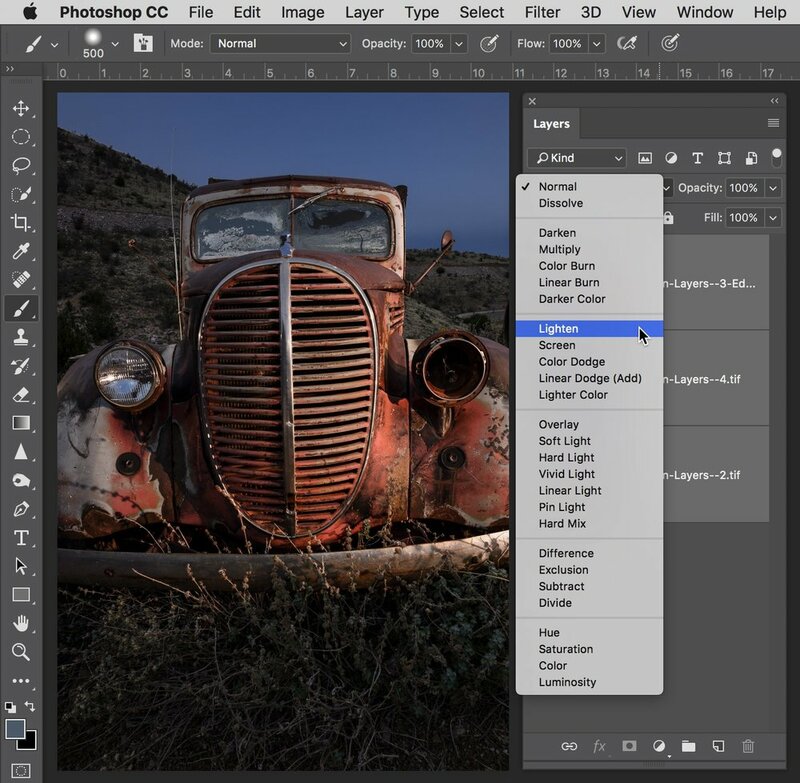 Begin in Lightroom by selecting the images you want to blend. 2. From the menu choose Photo–Edit In–Open as Layers in Photoshop (Figure 3). All of the images will open in Photoshop in separate layers within one file, as seen in Figure 4. 3. Click on the top layer and then hold down the shift key while you click on the bottom layer. This will select all of the layers in the stack (Figure 5). 5. With all of the layers selected, it’s time to change the blending mode, which is what makes the magic happen. Choose "Lighten" (Figure 6). Voila! As you can see in the image below, all the of the areas that I painted are now visible, creating one comprehensivley lit scene. Save and close. The image will now return to Lightroom. Figure 7. Final layered image. Nikon D4, Nikkor 24mm f/2.8 lens. Three layered images shot at 1/125, f/11, ISO 100, each with flash. Using the Lighten blending mode is a great trick for night photography. It allows for shorter exposure times, multiple attempts at light painting during star stacking, and even the ability to control the color and brightness of the individual exposures back in Lightroom!